We learned that we could make amazing natural skin care products by using local plants from the Great Bear Rainforest which have been harvested by the Tsimshian and Haida people for thousands of years. Our friends in the First Nations community have shared their knowledge of how the plants were traditionally used and which plants interact well together in order to make the best products. We're so fortunate to be able to harvest in some of the most stunning areas of northwest B.C., work with our friends and create a unique and exciting natural skincare line that brings you the Rainforest in a bottle! Bladderwrack is a seaweed found throughout the B.C. Coast. We use it in our products as an anti-inflammatory to soothe the skin. 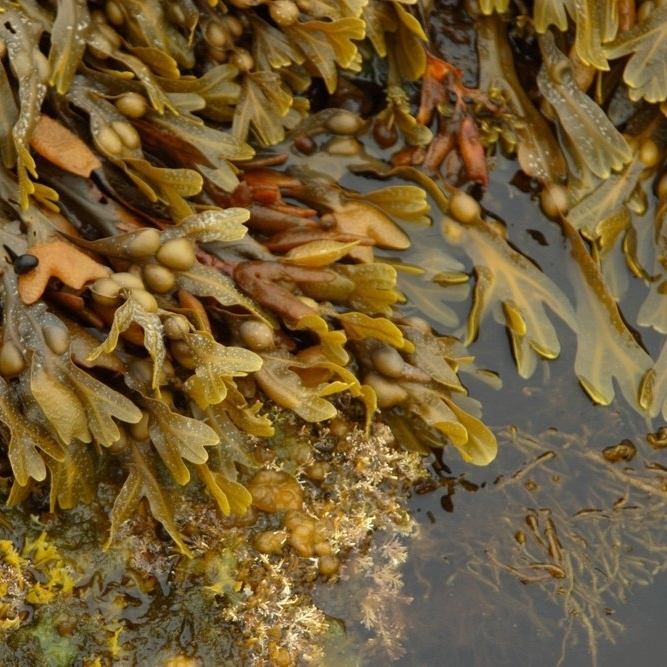 Bladderwrack is packed with B-Complex vitamins, calcium, iodine, iron, magnesium, potassium, sodium, sulfur and silicon. It also contains carotene, selenium, zinc and small amounts of Vitamins A, C and E which are attributed to its anti-aging and healing properties. This combinations of vitamins and minerals nourish dehydrated, mature skin, improve skin tone, texture and elasticity. Labrador Tea [Ledum ] or K'WILA̱/'MA̱XS in Tsimshian, means, “always grow”. The plant proliferates in acidic soil, and is found in bogs and wet forests. Because of its medicinal qualities, Labrador tea has been traded and used as a remedy for different illnesses over the last 10,000 years. Labrador Tea grows in the muskeg bogs of the Great Bear Rainforest. It’s our core ingredient and we wild harvest it sustainably to ensure that we can go back into the same areas year after year. This plant isn’t widely used in the skin care industry. This is likely because the plant does not yield a high volume of essential oil when it is distilled. The plants are packed with tannins, sesquiterpenes (a hydrocarbon), numerous mineral salts and Vitamin C, all of which combine to give it astringent and extremely potent antioxidant properties. It is fabulous in the treatment of skin irritation and inflammation, and as an antioxidant it works to combat free radicals caused by pollution and UV rays. Tests of Labrador Tea have proven that it is 20 times more potent than Idebenone* and 3 times more active than Vitamin C and grape seed extract in combating free radicals. *Idebenone is the bioengineered cousin of the vital human antioxidant enzyme – CoEnzyme Q10, and up to 1000x more effective. It is described as a “Super CoQ10″. It is designed to deliver a level of skin rejuvenation that you cannot get from AHA, Vitamin A, Vitamin C.
It’s exceptionally high in antioxidant-rich catechins; it’s 20 times more potent in antioxidant power than idebenone than and three times as potent as vitamins E and C. It’s full of skin-repairing and anti-inflammatory ursolic acid, and helps skin keep its natural elasticity, protects collagen and promotes the production of ceramides; all of which helps to delay and prevent skin aging, while ceramide synthesis allows proper moisture of the skin. Bull Kelp [Nereocystis] grows in kelp forests along protected shores and open coast areas between Alaska and California. It’s the fastest growing seaweed in the world, up to 60 cm/day! The scientific name 'Nereocystis' means mermaid’s bladder. The Coastal Tsimshian call it MOOḴ. Nootka Rosehip or K’ALAAMS oil has the ability to help regenerate new skin cells. While it is an astringent, it doesn’t dry out the skin; instead it helps to rehydrate and keep moisture in. It helps to keep your skin elastic and nourished. This will not only prevent wrinkles, but can actually help to minimize any that have already appeared. Nootka Rosehips have a high vitamin A content which helps to regenerate skin cells, and heals wounds and scars. First Nations people used the Nootka Rose as a food, medicine and building material. They made a tonic tea from the leaves, petals, branches and inner bark. The leaves were also used as a poultice for bee stings. The roots were boiled and combined with Western Red Cedar and gooseberry roots to make fishnets! Cedar is called the "Tree of Life"; it is the most magnificent tree in the Great Bear Rainforest. Every single part of a cedar tree serves a purpose for Coastal First Nations.We will be using cedar leaf oil for its' wonderful scent that draws you deep into the lush coastal forests!